Anna is Just Love’s South West Coordinator. She looks after groups in Cardiff, Exeter and Bristol. She studied Classical Studies at Exeter, graduating in 2018. 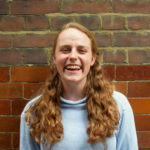 Anna was on the Exeter committee for two years, first as the prayer and worship sec and then as their local coordinator, before deciding she still hadn’t had enough of Just Love! She’s particularly happy that her job makes room for her somewhat contrasting character traits of being completely driven by feelings (sometimes appearing illogical) while also being an obsessive list maker who thoroughly enjoys colour-coordinating her google calendar.